RSPA-SOL Paper | ZIRCAR Refractory Composites, Inc.
ZRCI Silica-Magnesia Papers Type RSPA-SOL are thermal insulation products capable of withstanding continuous operating temperatures up to 1260°C (2300°F). Type RSPA-SOL papers are designed to have enhanced in-vitro solubility characteristics which enable them to meet European regulatory requirements for synthetic vitreous fibers (European regulatory requirements directive 97/69/EC). These unique papers exhibit excellent chemical stability and resistance to attack from most corrosive agents. Exceptions include hydrofluoric acid, phosphoric acid and strong alkalis. Type RSPA-SOL papers also provide superior wetting resistance to molten aluminum alloys at high temperatures. Type RSPA-SOL papers will generate small amounts of smoke and trace element outgassing during initial exposure to temperatures above 230ºC (446ºF). *Maximum use temperature is dependent on variables such as stresses, both thermal and mechanical, and the chemical environment that the material experiences. **Properties expressed parallel to thickness. ‡Properties expressed perpendicular to thickness. The following table summarizes the insulating characteristics of RSPA-SOL Paper. ZRCI Silica-Magnesia Papers Type RSPA-SOL according to directive 97/69/ec, posses a fibre chemistry within the regulatory definition of a “man-made vitreous (silicate) fibre with random orientation with alkaline oxide and alkaline earth oxide content greater than 18% by weight.” These fibres have been tested pursuant to EU protocol ECB/TM/26,Revision 7, Nota Q, Directive 97/69/EC, with results that are below regulatory thresholds. As a result, these papers do not require additional labeling or further testing. In addition, Intratracheal Instillation Biopersistance Testing per the German Hazardous Substance Ordinance has been conducted on these fibres with results that are below German regulatory thresholds. Refer to the product Material Safety Data Sheet (MSDS) for recommended work practices and other product safety information. Flexible High Temperature Pipe Insulation. Furnace, Kiln, Reformer and Boiler Lining. 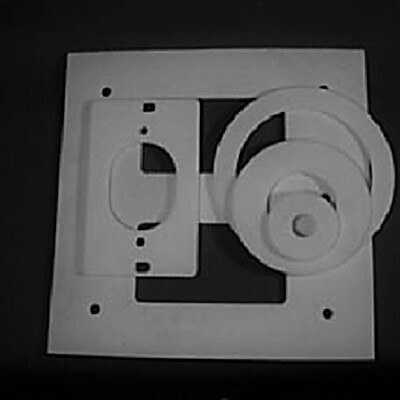 Furnace Door Linings and Seals. Useful When Refractory Ceramic Fiber Are Not Desired. Reusable Insulation For Field Stress Relieving Welds. Insulation For Primary Reformer Header. High Temperature Kiln and Furnace Insulation. Fire Protection For Pressure and Cryogenic Vessels. Lining For Incineration Equipment and Stack. Please call, fax or e-mail for pricing and availability. Prices are subject to change without notification and are subject to Zircar Refractory Composites, Inc. Terms and Conditions. All prices are F.O.B. Florida, NY and are in U.S. Dollars. This information, which is subject to change, is offered solely for your consideration and should not be taken as a warranty or representation for which we assume legal responsibility. It is not to be understood as permission or recommendation to practice a patented invention without a license and the user should determine whether relevant patents exist.